Lyricist Pulak Bandopadhyay has seen the world of Bengali music very closely for more than a period of around fifty years. In his book Kothai Kothai Rat Hoye Jai where he talks about some of his famous lyrics, depicts his memories with legendary singers, music composers, lyricists, actors, and many potential artists. This book finds mention of Bhupen Hazarika with whom he spent some intimate moments and witnessed the creation of a number of his unforgettable songs. Based on this book published by Anand publishers, here is a report about Bhupen Hazarika’s association with the world of Bengali music. ‘Our neighbor, owner of the Parijat talkies, Mukti Bhai planned to make a movie. The name of movie will be ‘Asamapta’. There will be five lyricists and five music directors in it. I was the one who recommended the name of Bhupen Hazarika. I cannot recall exactly where I heard the songs of Bhupen Babu. They struck me with their novelty! Mr. Ramen Mukherjee of the Alaka talkies instantly backed my decision. Receiving the invite at Guwahati, Bhupen Babu came to Kolkata with his wife Priyam Hazarika. At that time Bhupen Hazarika didn’t have a place of shelter to his own in Kolkata. He stayed at the residence of Lilluwa Chamatkar of the Parijat talkies. Met him very often there and listened to a lot of new Assamese songs that I didn’t listen before. ‘… The ex supervisor of the Eastern India Motions Pictures of Kolkata K.K. Choudhury started a movie. It was Kodi O Komal. While listening to his script at his house at New Alipur, I asked him- who have you chosen for music? He asked me instead- Who do you think would be a good choice? I suggested Bhupen Hazarika. K.K Choudhury was, actually, a Bengali gentleman from Guwahati itself. At the mention of Bhupen Babu he blurted out- Correct, this is final! Even I was thinking about the same person. The music of these two songs was taken from the Assamese songs Jonakore Raati Asomeere Maati and Osto Akashare Sopun Rohon Shani. However, he composed two more Bengali songs with this music which were sung by Lata mangeshkar. These were Jyotsnar Rati Pisu Tane Smriti and Asta Akasher Godhuli Rong. It is to be noted that the song Jyotsnar Raati was written by Bhupen Hazarika himself. I saw huge “triple congos” for the first time in my life in this hotel. What an amazing rhythm these Black artists had played in! Bhupen da whispered to me even on that day – Pulak babu, do capture the rhythm. I wrote a song on that rhythm- “Kalo meghe domboru/ guru guru oi shuru”. Subir Sen recorded the song in the lively voice of Bhupen Hazarika. At the other side of the record was the song “Ogo shakuntala, cole jeona”. 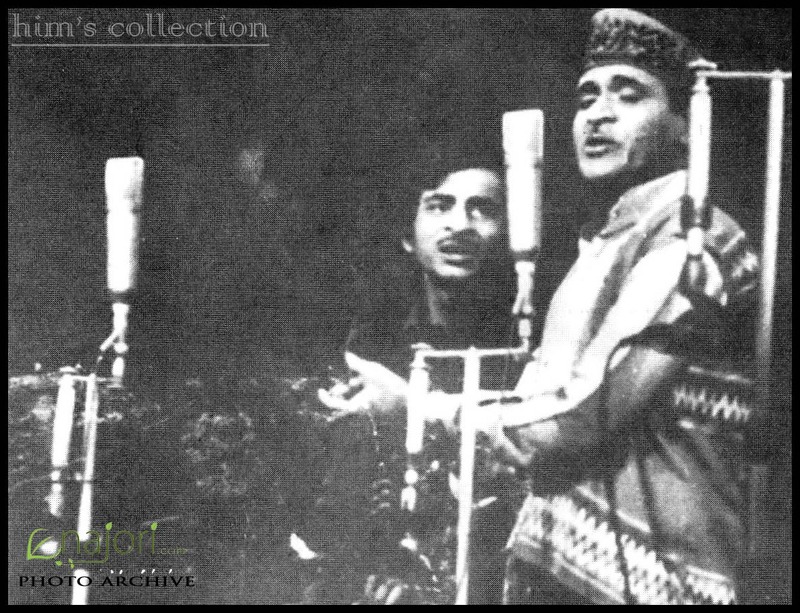 Bhuen Babu sang the Bengali song Kalo meghe later in Assamese as well- “dug dug dug dug domboru/ meghe bojay domboru”. The voice of nightingale Lata mangeshkar sang lot of his Bangla songs. Noted among them were “Rangila bashite” , “Mone rekh”, “Bhalo kore tumi”, “Aparupa aparupa”, “Oho mach ranga pakhate”, “Udki dhaner mudki deb”, “Fele asa pothpane”. The “rangila rashite” was Lata’s first Bengali song during the time of Puja. Pulak Bandopadhyay thus records the background story of the creation of this song in his book ‘Rat hoye Jai” – ‘ Bhupen Babu took the responsibility of directing Hemant Mkhopadhyay’s film “Neel Akasher niche”. (Though it was later directed by Mrinal Sing instead) Lataji came to Kolkata for the muhurat of the movie. I reached Damdam to welcome her. At the airport, Lataji said, “This time I will record my first bangla song of Puja. I really liked the songs of your “Kadi o komal”. Please ask Bhpen da to give music for two songs.” A lot of people talked to lata and she told them “I will attend the muhurat tomorrow and will fly back to Bombay the day after tomorrow.” And she told me “I will record the songs before I leave.” I wondered when she will record then. Maybe, this is how the famous talk! These were the tidbits of the story. : Why there is one – “Mone rekho ogo adho cand” – That I based on your music. : I don’t remember the song. And I had given the harmonium for some fixing but they have not yet retuned it. Slowly, he started rendering his voice for other music composers as well. Noted among them are: ‘O malik sarajiban kadale jakhan’ of Suparnakanti Ghosh, Hemant Mukherji’s ‘E kon Bharatbarsh’, Lokman Fakir’s ‘Amay ekjan sada manush’, Prabeer Majumder’s ‘Ami bhalobasi manushke’, Aparesh Lahiri’s ‘Oi kajal dighi’, etc. Moreover he has sang for music composers like Angshuman Rai, V. balasara, Krishnendu Das, Anathbandhu Das, Aloknath Dey, Dinendra Chaudhuri etc. ‘Manush manusher jonye’, ‘Dola he dola’, ‘ai ai chute ai’, ‘ganga boish keno’ were the songs that made Bhupenda very close to the masses. He started translating and singing in a lot of Bengali songs from Assamese. The majority of songs were translated into Bengali by Shivdas Bandopadhyay. The prominent among these are, ‘Pratidhwani shuni’, ‘dola’, ‘somoyer agragrati’, ‘ekti kudi duti pata’, ‘bohudin agetei’,’ei gan hok’ etc. Moreover, ‘sahasrajane more’ translated by Gauriprasanna Majumder and songs such as ‘cira uchal dheu’, ‘shoishobete kheyali’ translated by Mintu mukhopadhyay are bright stars in the world of Bengali music! Truly, our pride knows no limit when it comes to Bhupen Hazarika.